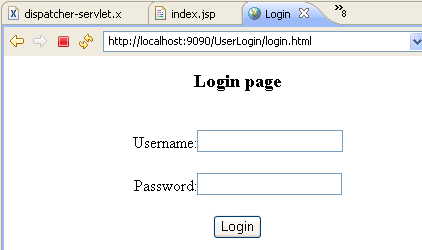 In this page you will learn how to create login example. This section explains you how you can make Login example using Spring MVC module. In this login example we are not connecting to any database, but you can easily add the database access code to validate your user. In this example if user enters Username: admin and Password: admin, user get validates successfully and success page is displayed. If user enters something else error message is displayed. We have also validated the form data using the a custom validator class. Here we will create a user login web application that accept two values username and password entered by the User. If the username and password is correct then user successfully login otherwise application display errors for user. Now we will create two jsp files inside WEB-INF/jsp/ folder. First is login.jsp for taking input from the user and other is success.jsp for display the login success in this application. The login.jsp file will have two text fields (username and password) for take input by the users. Download Code of Spring MVC Login Example discussed here.